Home » SPPI eWire 8/24/2007 » The Iris Opens Again? Back in 2001, Richard Lindzen and colleagues made quite a stir in the climate community when they published a paper in the Bulletin of the American Meteorological Society in which they describe having possibly identified an “adaptive infrared iris” that opens and closes to keep the earth’s temperature fairly steady even in light of increasing atmospheric carbon dioxide levels. It was proposed to work something like this—when the temperature in the tropical oceans begins to warm up, it causes in increase in the amount of low-level water clouds and an even greater decrease in total coverage of high-altitude ice clouds. Since ice clouds are net warmers (that is, they trap more outgoing longwave radiation (heat) than they reflect away incoming shortwave (solar) radiation) and water clouds are (generally) net coolers (reflecting back to space more incoming solar shortwave radiation than they absorb outgoing longwave radiation), more of the latter and a lot less of the former leads to a net cooling, and the temperatures of the tropical oceans decrease. However, cooler tropical ocean temperatures lead to less low-level (water) clouds and more high altitude ice clouds. This configuration tends to lead to a net radiation increase and to higher temperatures. And the cycle starts over again. Lindzen’s moniker “adaptive infrared iris” refers to the mechanism in which the tropical ice cloud cover opens and closes in response to tropical ocean temperatures to allow more heat to escape to space when the oceans are warm and less heat to escape to space when the oceans are relatively cool (much like the iris of an eye which opens and closes in response to varying light levels to try to maintain a constant level falling on the retina). Lindzen et al. proposed that the iris acts as a global thermostat that will keep the earth’s temperatures from rising very far even as atmospheric concentrations of greenhouse gases increase. Needless to say, Lindzen’s iris hypothesis ran into opposition soon after it was published (e.g., Hartman et al., 2002). The biggest problem with it was that it was based on temperature and cloudcover data from only a portion of the tropical western Pacific for a limited amount of time (about 20 months). Other researchers came along and declared that they could not find the iris mechanism operating in the cloud and temperature datasets that they looked at, and the idea generally fell into disfavor. Even Lindzen was forced to admit that it likely did not operate as strongly as he had initially theorized. Nevertheless, the idea has not altogether died and research shows up in the literature from time to time that describes various efforts to look for the iris effect. The latest of these just appeared in Geophysical Research Letters. Satellite gurus Roy Spencer and John Christy teamed up again, along with colleagues William Braswell and Justin Hnilo to examine the associations between cloud cover and temperature that occur during intraseasonal oscillations that occur in the tropics. Oftentimes, tropical convective rainfall goes through a 30-60 day cycle, from suppressed to enhanced activity and then back again. Along with rainfall variations, these oscillations are accompanied by variations in atmospheric cloud cover, temperature, and circulation patterns (see here for more information on this phenomenon). What Spencer and colleagues did, was to examine the relationship between the types of cloudcover, the patterns of temperature, and the type and amount of radiation that the earth was losing to space over course of the intraseasonal oscillations. Since the surface temperature change during the oscillation is substantial, on the order of 0.5ºC during the stronger events, the accompanying changes in the other attributes, such as cloud type, may reflect the types of processes that would occur under conditions of an overall warming climate—just on a smaller time scale (weeks rather than decades). What Spencer and colleagues found breathes new life into the iris hypothesis. Spencer’s team identified an increase in low-level water clouds during the warming phase of the tropical intraseasonal oscillations, but found that while the amount of high altitude ice clouds increased initially, they unexpectedly reversed course and rapidly declined as the temperatures continued to climb. This decline in ice clouds progressed until the temperatures peaked and began to fall again. 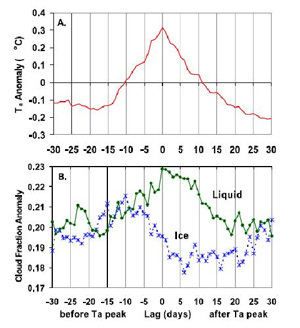 Figure 1 shows how the two types of cloud cover (water and ice) evolved over the course of the rise and fall of temperature during a composite of the nine strongest intraseasonal oscillations identified by Spencer’s team. Figure 1. (Top) Low level atmospheric daily temperature anomalies averaged over the nine strongest intraseasonal oscillations identified by Spencer et al. (2007). (Bottom) Anomalous amount of water clouds (green line) and ice clouds (blue line) for each day averaged over the same nine events. (from Spencer et al., 2007). By the looks of it, this behavior seems much like that originally described by Lindzen, and this time it is detected in a study that is much larger in scope, both spatially and temporally, than Lindzen’s original study. The decrease in ice cloud coverage is conceptually consistent with the “infrared iris” hypothesized by Lindzen et al. , who proposed that tropical cirroform [ice] cloud coverage might open and close, like the iris of an eye, in response to anomalously warm or cool conditions, providing a negative radiative feedback on temperature change. We caution, though, that the ice cloud reduction with tropospheric warming reported here is on a time scale of weeks; it is not obvious whether similar behavior would occur on the longer time scales associated with global warming. However, if it were applicable to the larger-scale climate picture, its impact could be substantial. Since all climate model projections of future temperature rise from increasing atmospheric concentrations of carbon dioxide predict that accompanying cloud cover changes will serve as a positive feedback that acts to enhance future warming rates, if the models had this wrong, then future warming would be substantially less than projected. Perhaps the future isn’t as dim (or, as warm, rather) as Gore and his cronies would have us believe. Hartman, D.L., and M.L. Michelsen, 2002. No evidence for iris. Bulletin of the American Meteorological Society, 83, 249-254. Lindzen, R.S., et al., 2001. Does the Earth have an adaptive infrared iris? Bulletin of the American Meteorological Society, 82, 417-432. Spencer, R.W., Braswell, W.D., Christy, J.R., Hnilo, J., 2007. Cloud and radiation budget changes associated with tropical intraseasonal oscillations. Geophysical Research Letters, 34, L15707, doi:10.1029/2007/GL029698.